Islamic State claims responsibility for attack at the London Underground which injured 29 people. 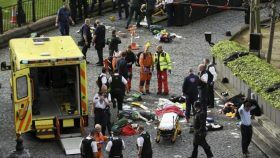 The Islamic State (ISIS) jihadist group on Friday claimed responsibility for the explosion at the London Underground, the Site Intelligence Group said. 29 people were wounded in the explosion at the Parsons Green station, the BBC reported. Scotland Yard said the explosion was caused by an “improvised explosive device” which was detonated on a train during Friday’s morning rush hour. A hunt for the terrorist who placed the device is under way and the area around the station has been evacuated. None of the victims are thought to be in a serious or life-threatening condition, according to the London Ambulance Service. A British security source who has been briefed on the investigation told CNN on Friday that a timer was found on the explosive device. It’s clear the device was intended to cause much greater damage, the source said, but cautioned that the investigation is still in its preliminary stages. Another source briefed by investigators told CNN that an initial assessment of the device indicates it is “highly likely” to have contained the explosive TATP but that this has not been confirmed. It also appeared to have been crude and poorly designed, the source said.